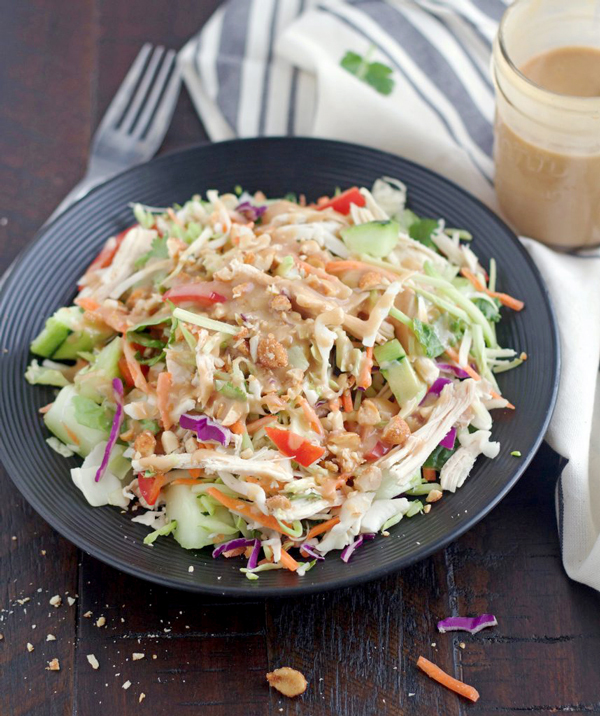 This Thai Chicken Crunch Slaw Salad is such a simple, fresh and healthy salad. 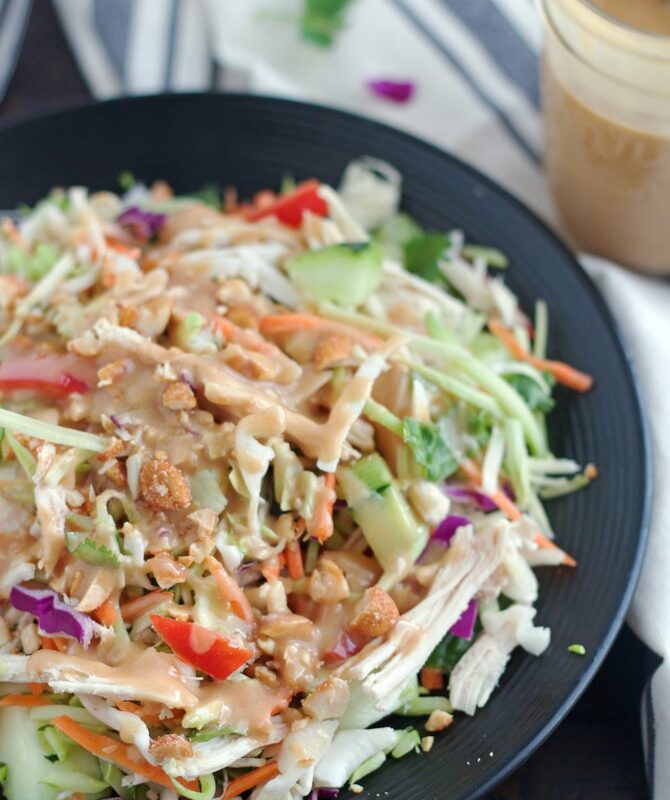 It’s packed with so much goodness and then topped with a delicious Thai peanut dressing. 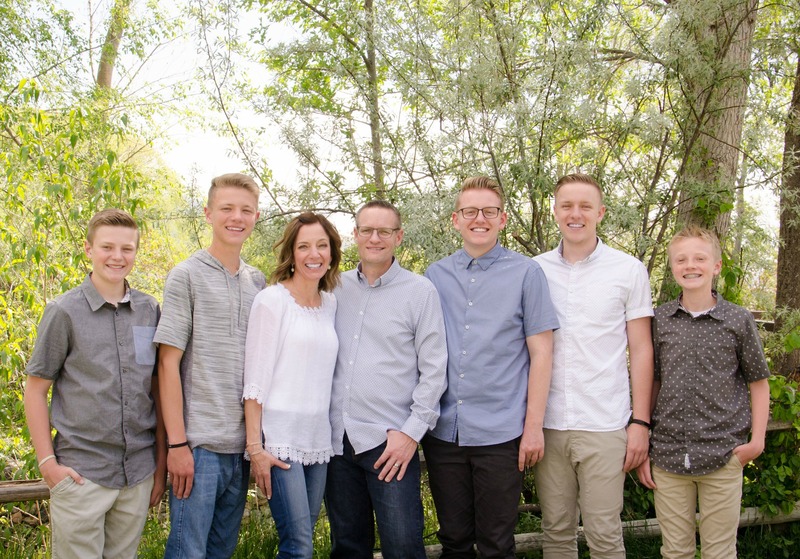 I am so excited for General Conference this weekend. Cinnamon rolls are always a must for General Conference, I just haven’t decided if I should make these, or these, or maybe even these (the ones I grew up on) . . . ugh, I’m the worse at making decisions . Knowing myself and my love of cinnamon rolls, I’m sure I’ll make some Saturday and Sunday. If you love cinnamon rolls but hate how long they take, and working with yeast terrifies you, then my cinnamon biscuits are always a good option because they are so fast and simple, if you haven’t tried them you should. Now let’s talk about something a little healthier shall we? I absolutely love meals like this Thai Chicken Crunch Slaw Salad. It’s fast, quick, packed with veggies and incredibly delicious. Plus I love a good salad for dinner or lunch. Sometimes it’s just a nice change of pace. Now if you’re a meat and potatoes kind of person, and don’t usually have just a salad for dinner, then you might want to give this one a try. It’s loaded with carrots, broccoli slaw, bell peppers, cabbage and cucumbers. Man, talk about a getting your veggies in. Then you’ve got chicken and peanuts and it’s finished off with a Thai peanut dressing that is so delicious. This salad can be thrown together in minutes. It’s so easy peasy because the coleslaw, broccoli slaw and carrots are already to go, no cutting, slicing or chopping even needed. The cucumber, cilantro and red pepper take just a couple minutes to chop. You’ve gotta love a quick, delicious meal like this. You can even make ahead of time and just keep it in the fridge. Make sure you don’t forget the peanuts, they seriously take this salad up to a whole other level. Oh and the dressing, it’s rather fabulous if you ask me. I found myself dipping the extra pieces of chicken in it after I’d finished my salad. . . Mmmmm! It looks like I was being rather modest with the dressing (and peanuts) in these pictures, but trust me, I poured more on it before we gobbled it up. Now I’m not going to lie, salads are not Taylor’s, Braydon’s or Parker’s most favorite thing (yeah, they’re kinda lame!). Taylor and Parker will eat lettuce with ranch dressing and occasionally plain coleslaw on top of their pulled pork sandwiches. Braydon is getting slightly more daring and adventurous, but he still is fairly anti-salad. I really thought I taught them better, but apparently not. I think they pulled out a frozen corn dog for dinner the night the rest of us devoured this delicious salad. Totally their loss! One of these days they will hopefully come to their senses and realize what they’ve been missing out on. A parent can only hope, right? In a large bowl combine the coleslaw, broccoli slaw, carrots, chopped red pepper, cilantro, chicken and cucumber. Set aside. In a small bowl, whisk together the peanut butter, vinegar, lime juice, both oils, soy sauce, water, honey, sugar, garlic and salt. Whisk until smooth. Toss entire salad with dressing and sprinkle chopped peanuts or just drizzle dressing over individual plates of salad mixture and then top with peanuts. If you don't have sesame oil and don't want to buy any, go ahead and leave it out, it will still be delicious. I like to let every one dish up their own plates of salad and then let them drizzle on their own dressing. This way if the entire salad doesn't get eaten, I can store the extra salad in one container and the dressing in another and it doesn't get soggy. I need this salad now! It looks so good. I may have to go buy all the ingredients so I can eat it while watching conference. It’s so good Kate. You’ll be eating this delicious healthy salad while I’m eating cinnamon rolls! I hope you love it. This was absolutely DELICIOUS!! I could have drank that Thai Peanut Dressing! Thanks for sharing a great recipe! I totally agree! Thanks sis! This recipe is soooo good! I love how fresh it is and it tastes amazing! Oh this is one of my favorites Becca! I agree, it’s so fresh and tastes amazing!! I was making this salad and the dressing directions said to blend the peanut butter but I do not see pn butter in the ingredient list. What have I missed? Hi Linda, I’m so sorry about that. It’s 1/4 cup peanut butter and I’ve fixed it. I converted all my recipes over to a new plugin several months ago and I’m guessing the peanut butter somehow got left off in the conversion because my neighbor and sister have made this several times and never said anything about the missing peanut butter. . . lol! Thanks for catching that.